As a homeowner in Leesburg, Virginia, it is important to always look toward the future, especially when it comes to home improvement projects. How will a project impact the look of your home? How will it impact the functionality? How will it impact your ability to sell your home down the road? And. Perhaps most importantly, how will it impact your home value? It’s all about that almighty return on investment (ROI). And while a new fence may not boast an ROI as high as kitchen or bathroom remodeling, at a 50% return on investment, according to Remodeling Magazine’s Annual Cost vs. Value Report, the potential return on a new fence is nothing to scoff at. In layman’s terms, when you sell your home, you can expect to recoup $0.50 for every $1.00 they spent on your new fence. 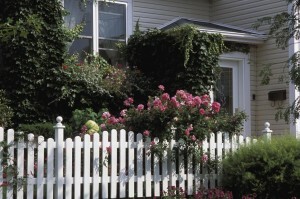 A fence is a great way to boost the curb appeal of your home. A fence is a great way to improve security. A fence can help keep your children or your dog safe. Click Here to learn about choosing the right residential fence for your home. Since 1955, Hercules Fence of Northern Virginia has been providing professional fence services and installation throughout Leesburg and the rest of Northern Virginia. We take great pride in our work and can handle all of your winter fence installation needs: Custom Wood Fences,Ornamental Steel Fences, Ornamental Aluminum Fences, PVC Vinyl Fences, Chain Link Fences, and more. Plus, as the largest fence company based in Northern Virginia, Hercules Fences has the ability to buy fencing products you want at a price you’ll love. That’s what we call a win-win! If you have any questions about installing a New Fence in Leesburg, you can contact Hercules Fence today by calling (757) 316-3600! We are the largest fence company based in Northern Virginia. You can also follow Hercules Fence on Facebook, Twitter, Google+ and YouTube. This entry was posted on Thursday, February 19th, 2015 at 3:02 pm. Both comments and pings are currently closed.